A veil of mist creeps down the hill as we approach Vennford Reservoir. This isn't the same place I remember from family days out when growing up. If Dad had not decided to take one of his infamous 'mystery tours' along narrower and narrower lanes that led to an abrupt halt and forced our retreat; if he had plumped instead for the safer option - then we would often disembark at Vennford for an idyllic walk around the lake. This would often be during an old-fashioned English summer of the warm and dry variety. I would look at at the depth gauges and often wonder if they were low enough to precipitate (if you'll pardon the pun) a hosepipe ban. 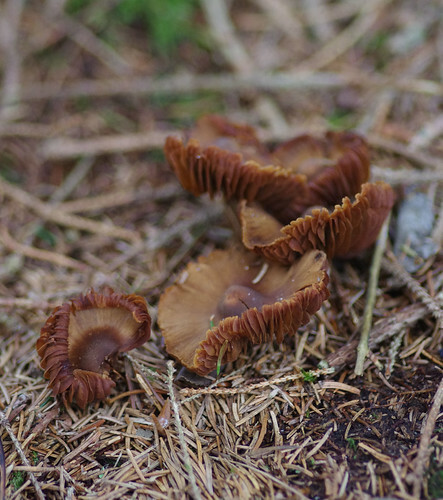 Instead we are in the midst of autumn, which can only mean searching for mosses, lichens and, of course, fungi. After all the recent rain, the main path to the first southern entrance gate is a tad on the boggy side. I have heard urban myths of obsessive Japanese gamers who have grown extra thumbs. Might there not be the odd British rambler walking around with webbed feet? 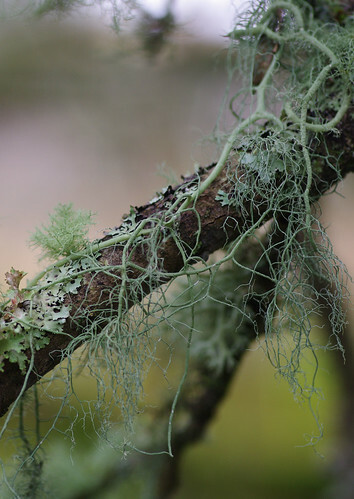 This lichen is often found on twigs or amongst the leaf litter on the woodland floor. It is also highly prized by the perfume industry. 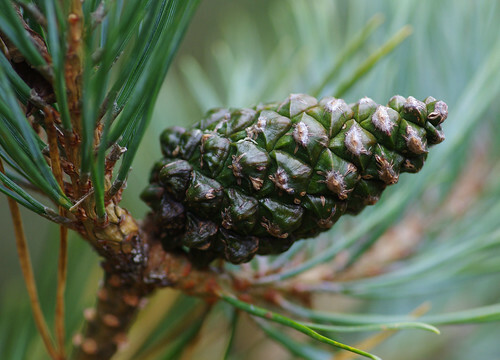 Apparently, it is added to a scent to prolong and intensify its character. And the other night on television, I caught a glimpse of a Hugh Fearnley Whittingstall programme which featured 'deep fried oakmoss' to accompany a mushroom starter. What will they think of next? 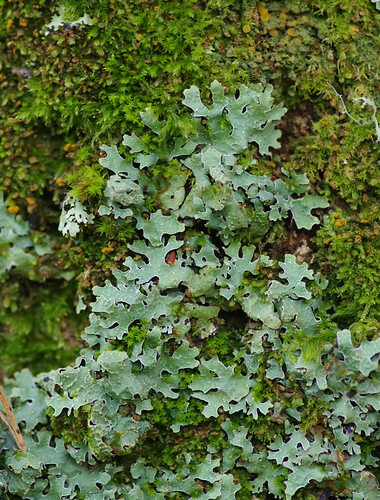 These strangely-shaped lichens remind me of jigsaw puzzle pieces. Look closer and you can just detect the dented surface that appears hammered into shape and gives them their name. This was wrapped around a tree branch and gave me yet another identification headache. 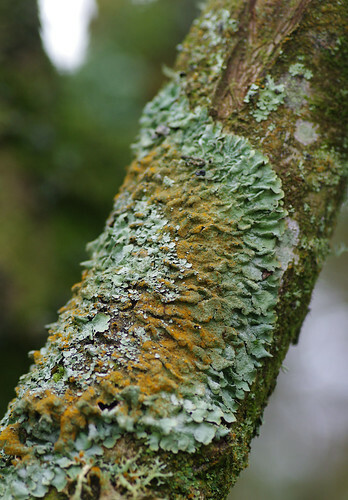 One of the problems with lichens is that they vary in colour. 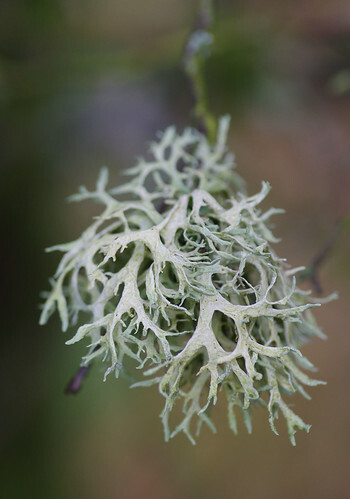 Most species are grey when dry and take on a greener appearance when wet. 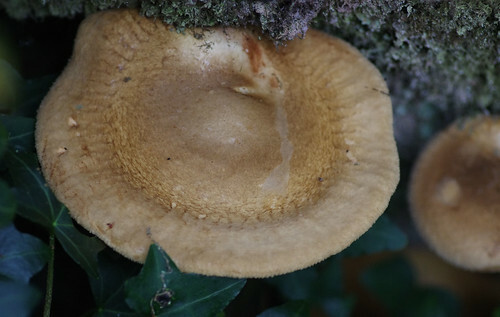 The edges are often lobed and each specimen is capable of altering as it ages. 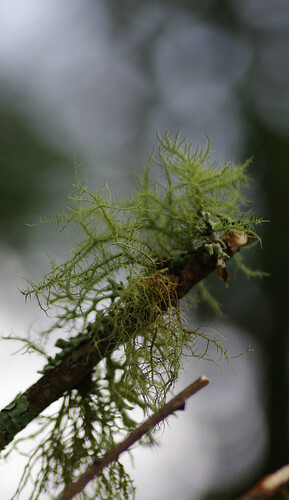 The dusting of orange is actualy a separate species: the alga Trentepohlia. I have made a resolution to focus on fewer species at a time and to make more accurate observations. I have been guilty of treating our outings as a sort of race - trying to cram in as many species as possible. Now I know it's far better to have a handful of confirmed sightings and recordings than a whole host of ambiguities. This species of fly looks more orange in many pictures I have seen on wildlife sites. But as we were in the shade and under a tree (using natural light) this was perhaps closer to its real colour. Unless, of course, I have picked the wrong fly. 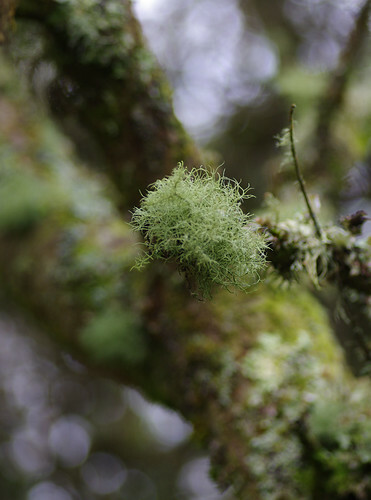 The nobbly-ended lichen it is resting on, is currently unknown but I will keep looking. No doubts need to be raised regarding the species above. It has oval to circular discs along its length. I have seen seaweeds like this before but not lichens. This picture reveals the recent rainfall levels. I am usually dedicated to the naturalists' cause. 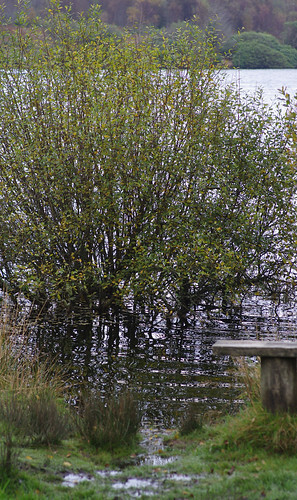 But having left the wellies at home, I did not fancy wading further in to ascertain what type of tree had had its trunk submerged. 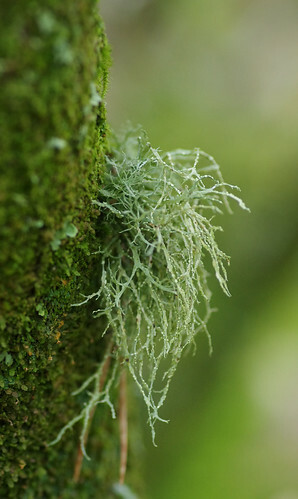 Although the reddish main stem could indicate any usnea type, this is a characteristic feature of Usnea rubicunda. The specimen above is partly constricted but nowhere near as dramatic as other examples I have seen in books. Looking more like strings of spaghetti, it could be a relatively young species. The yellowish cast of the light did not match our visual experience. Manual and aperture priority mode were used for a few shots which could explain the discrepancy. 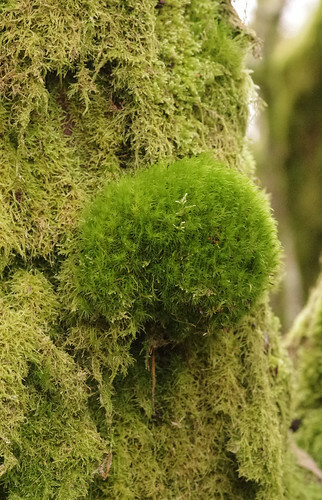 I don't know why but I keep thinking this green ball covers a warty protruberance on the trunk. With the camera back to its automatic setting, the results more accurately reflected the colours we were seeing. 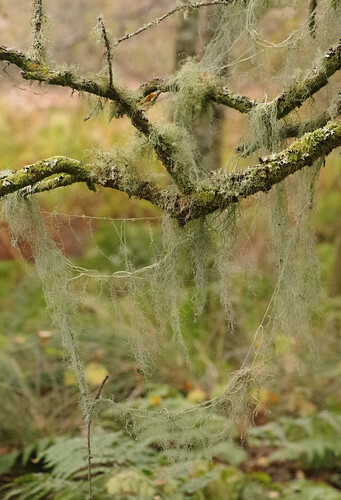 There is another Usnea species present slightly to the left (it looks like a miniature tree) and also a foliose type of lichen attached loosely to the branch, almost like leaves. 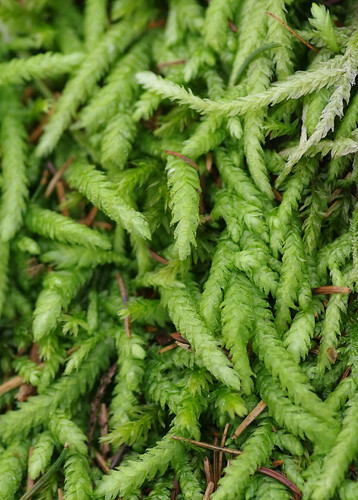 These mosses have spiky ends to their capsules. 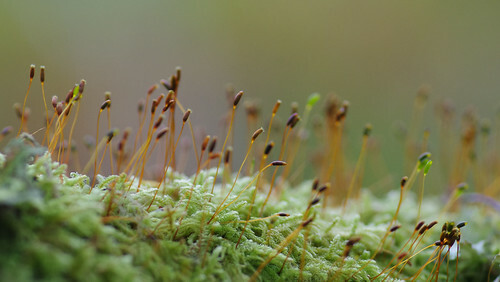 Thus far Ihave neglected the study of mosses (or bryology to give the correct technical term.) 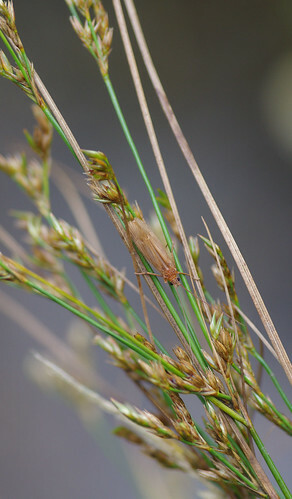 With hundreds of British species and no field guide, identification is almost impossible. 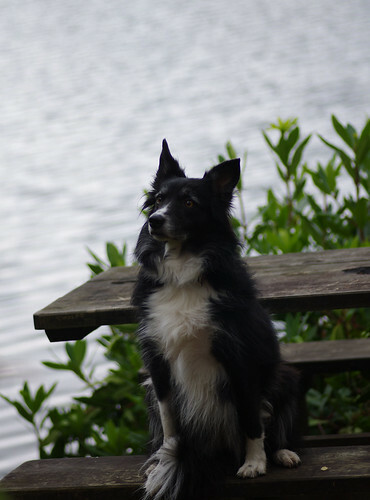 At the reservoir's edge, we spotted this creature. Sherry edged closer and managed to attain a precise focus. 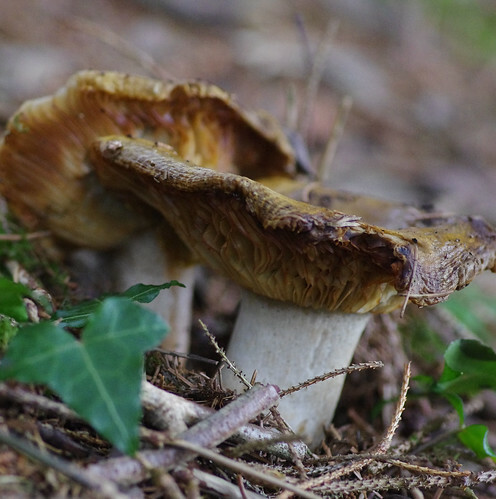 Often, on our travels, we see fungi that have been pulled out of the ground to aid identification. Some species can be identified by their gills alone, whereas others require a multi-faceted approach to colour, shape, gills and the stem. 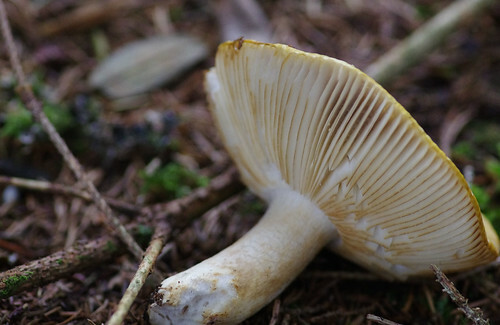 When fungi are cut they often bruise or bleed a specific colour (such as the milkcaps). Experts also take spore prints to examine under a microscope. At this stage we had strayed from the main path, deciding to explore what puzzling tresures lay in wait among the twigs and needles. Literally everywhere we turned we were encountering new shapes. 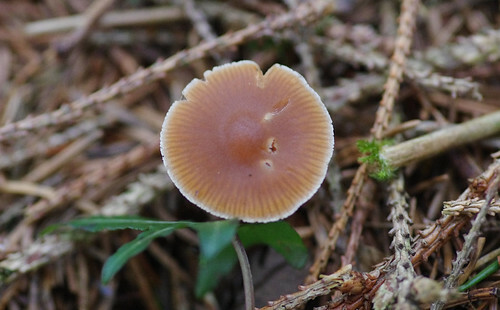 The disc-shaped specimen with the white rim looks superficially like Mycena pearsonina. These were tiny and the narrow depth of field required several shots to be deleted and then the framing recomposed. 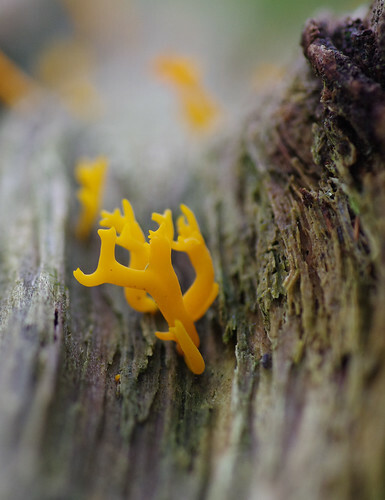 When viewed this close, they look waxy - like cats that have been adjoined. The odd stomach rumble signalled a recess for lunch. The fungi had thoroughly diverted our attention and Lady was feeling a bit left out. She soon perked up after a mouthful of pasty and a couple of sweet chilli crisps.